Students can choose to live in the University dormitory, private hostel or to rent apartment in the city. 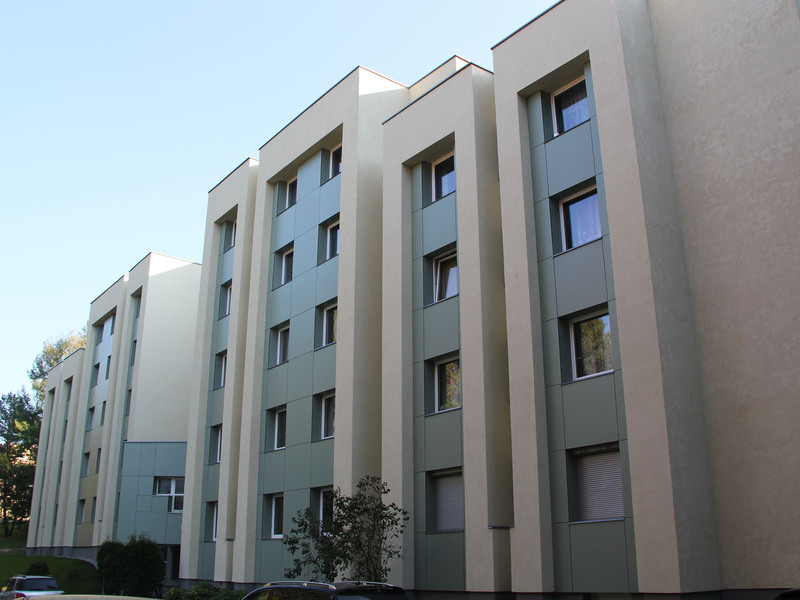 VGTU international students dormitory is located in the university campus, it takes about 7-10 min walk to the building of administration of the VGTU and faculties of Civil Engineering, Environmental Engineering, Business Management and Fundamental Sciences. Faculties of Architecture, Electronics, Mechanics and Transport Engineering are located in the city center; A. Gustaitis Aviation Institute is located in Likmenų st. 28. See VGTU maps here. Administrator: Jonas Rutkauskas, phone +370 692 20625. Reception: phone + 370 5 269 8827. The price for 1 person per 1 month is from 110 EUR to 150 EUR. Deposit: 300 EUR, if you have not caused any damage, it will be repaid when leaving. For the dormitory you will have to pay in bank in the first three days after your arrival. Due to a large number of incoming students we are not able to accommodate you in a single room! Usually it is a block, which consists of two double rooms, a hall, WC, shower and a kitchen. There are few blocks that contain one double room, WC, shower and a kitchen. Each room is fully furnished with two beds, one desk, little cupboard, table and two chairs. There is a sink, refrigerator, electric cooker and two dressers in every kitchen. There is a wardrobe in each room. There is a special work-room for architecture students. Each person is provided with a blanket, pillow, pillowcase, sheet and towel. Bed clothes are changed for cleaning every ten days, but in case of need they may be changed more often. Rooms are cleaned two times a week. A guest may refuse the cleaning if he/she wants to take care by himself. The water is drinkable in the dormitory. The dormitory has a central heating, each person cannot control it, the heating season starts usually in the middle of October each year and ends at the beginning of April. Meals are not included in the rent price. Students prepare their own meals in the common kitchen (two rooms share a kitchen). There is a café in the hostel, a grocery store and a laundry close to the building. If there are any problems with electricity, water, locking, etc, a student should inform the receptionist and the problem will be eliminated. There is a receptionist in the dormitory 24/7. Inhabitants are expected not to have guests after 11 p. m. The dormitory is locked up at night. However, inhabitants are let in at night. It is also possible to rent a flat in the city. The price for a 1 bedroom flat in the city is around 150 - 300 EUR per month though well furnished places tend to be more expensive. The ESN VGTU (Erasmus Student Network) team is very closely involved helping students to find private housing. There is a variety of private hostels that students can choose according to their preferences and needs. Some pivate hostels, like "Corner Hotel” and "Green Hotel" are long-term accommodation oriented. Corner Hotel is situated close to city center, close to faculties of Electronics, Mechanics and not so far away from Architecture faculty, which are not at the main university campus. Green Hotel is a bit farther from the old town yet a convenient hotel‘s location provides easy access to city center.